I want to make an appeal to those well-meaning but misguided folks who assemble the bouquets at our corner florist shops. And I especially appeal to the corporate creative department at FTD, which fuels and/or dictates much of the design aesthetics for these small business owners. In the name of God, please STOP! What you are doing is an abomination. It is a blasphemy against the laws of nature and how God intended plants to grow. 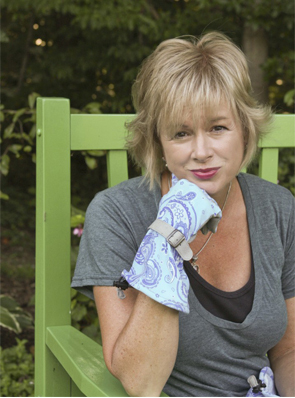 Have you ever visited a garden? If so, did you EVER see all of these plants lined up uniformly in a symmetrical orb with no stems, leaves or branches–resembling a basketball? Must you reduce Baby’s Breath and ferns to an afterthought? And why must containers be so very sweet? 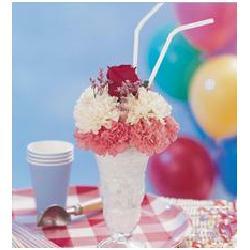 Do we really need flower arrangements that look like ice cream sundaes? Carnations colored into fluorescent hues of green or orange? Teddy bears hugging our tulips? Mr. or Ms. Florist, can you please pick up a couple of design magazines and see what is au courant? It’s not this tightly packed, overly-colorful, cheap flower arrangement that are the equivalent of the super-tight permanent wave cranked out at smelly “beauty parlors” in small towns in our fair land. We have a local florist that my husband, until recently, faithfully visited for my birthday, anniversaries, Valentine’s Day and other important occasions, including when he was in the Dog Haus. I dropped by recently because they had a sign advertising a good deal on tulips. Frankly, I can only conclude that these people do not actually LIKE flowers. As I entered, I had to pass all manner of “arrangements” that would make the average weekend gardener convulse. It was like entering a flower torture chamber. They were packed, crammed, twisted and contorted into every manner of unnatural pose imaginable. When I finally made it to the bargain tulips, I could hardly breath. To be sure, the FTD folks seemed to have hired at least one younger-than-80 creative person. 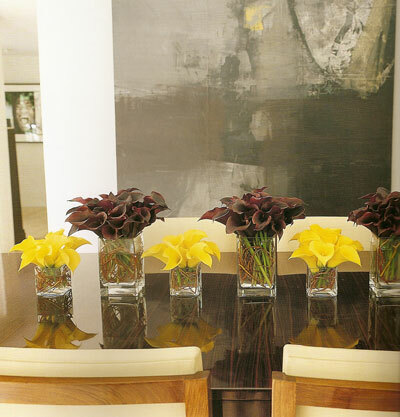 They now offer minimalist arrangements by Todd Oldham and Vera Wang. But, really. $110 for an orchid that I can buy at Lowe’s for $20? There is a way to go before you’re there, FTD. 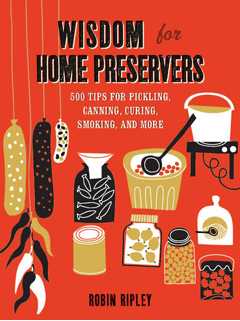 Let me recommend a book for your education and edification. 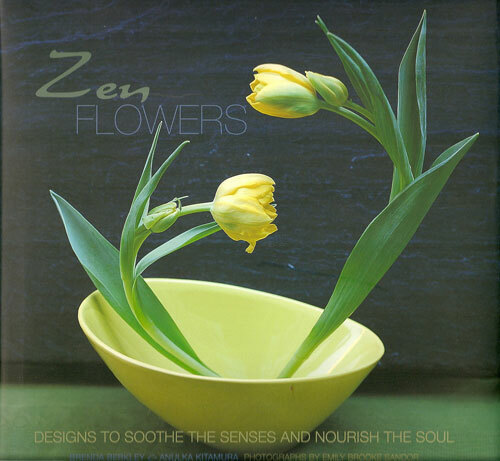 It’s called Zen Flowers, by Brenda Berkley and Anulka Kitamura. 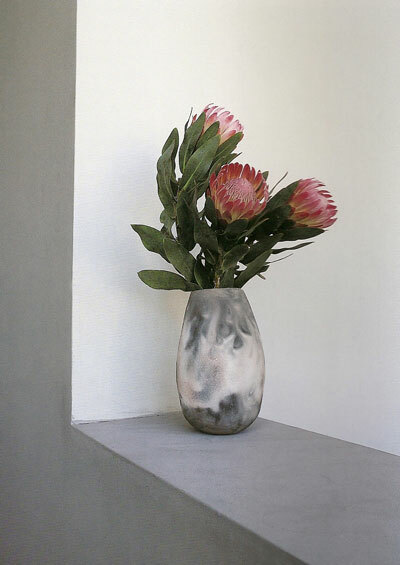 It is filled with examples of airy, simple and tasteful arrangements that honor the original plants and do not involve torture devices or demeaning containers. I know that Ikebana may not be for everyone. And I acknowledge the commenter from my previous post on the topic who said that there are some flower-buyers who expect quantity rather than quality. 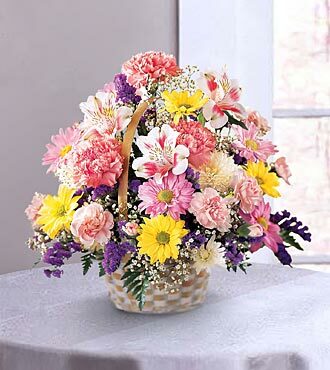 But I also believe that it is incumbent on florists to help educate their customers on nature and taste. Do you reall WANT to torture all those tulips? Pervert those petunias? Wrestle those roses? 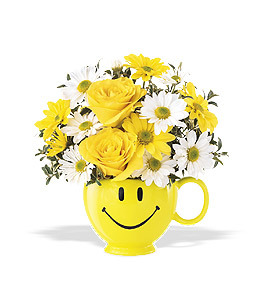 But I am hoping that someday we can banish mounds of ice cream sundae flower arrangements or flowers in yellow smiley face cups. I hope that as gardeners we can help educate our friends and families that a simple arrangement in a humble, but natural container, is more aesthetically pleasing than a tacky ceramic container made in China. I would prefer some spring daffodils in a recyclable aluminum can to the overly-wrought arrangements that contort and distort nature. I always tell people that a little bit of wildness breathes life into a greenspace. This philosophy also happens to make it easier to justify the times when I don’t exactly get everything done to perfection in the garden. There isn’t time to do everything and to do it well, so a laissez-faire policy seems to work as well as any to justify what I do (or don’t do). So I have to wonder if I have the discipline and patience to accomplish a topiary. Can I do all that training and trimming and spritzing and pinning? Do I even have the time? I may have to give it a try. I have fallen in love with green dogs–topiary dogs. 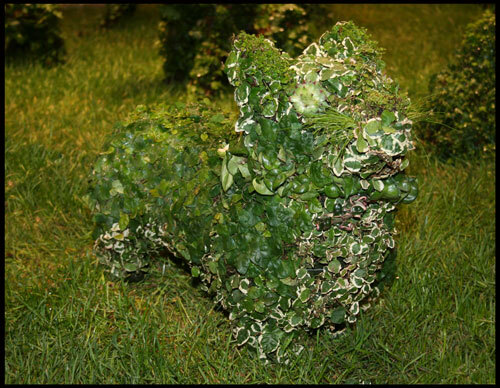 Take a look at this pooch from the Philadelphia Flower Show, accomplished with multiple varieties of ivies. Some are solid and some are variegated. See the little pine needle sprigs for his whiskers? 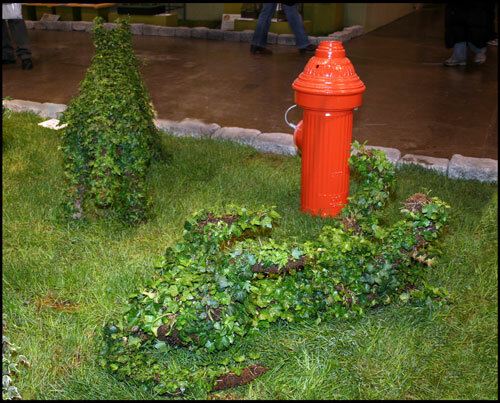 There was a whole topiary dog park at the flower show, complete with the obligatory fire hydrant. Some were sniffing and some were playing. I thought this fellow lolling on his back for a tummy rub was clever. 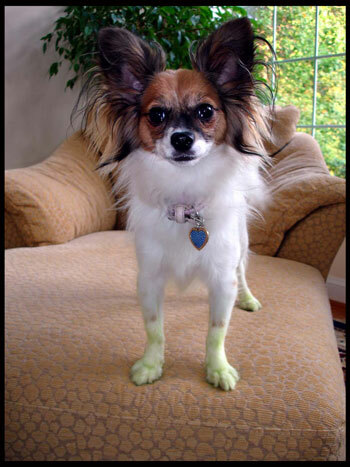 Since I adore dogs, I think a nice green dog would be a wonderful addition to my garden. And I have extraordinary patience with my real dogs. Perhaps that would transfer to a topiary dog. 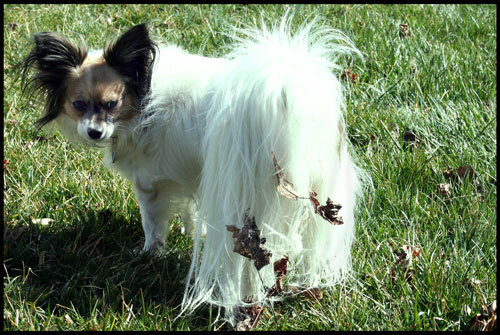 Nice try, Sarah, but topiary dogs are green, not brown. Um. Okay, you’re partly green now. But you’re still not a topiary dog.